No one wants a rain check for Christmas. Remember the Nintendo Wii shortages a few Christmases ago? Some stores sold out of the popular video game system in minutes and many stores didn't offer rain checks. The stores that did offer rain checks didn't have the consoles until January, and a rain check wouldn't be that much fun to play with on Christmas morning. To prevent a gift-giving catastrophe this year, WalletPop came up with a list of products that consumer electronic experts expect to be popular Christmas gifts. These are gifts that you don't want to wait until the last minute to buy, or expect a sale on soon -- although they might be discounted at Black Friday sales. We realize it's not even Halloween yet, but now is the time to think about what popular gadget you want for Christmas, or want to give, and buy it before it possibly sells out. "If you know it's going to be a gift for someone, you're better off buying it now," said Anthony Scarsella, chief gadget officer at Gazelle, which buys and sells used electronics. If that sounds like old advice, it is; retailers were saying the same last year due to low inventory. No surprise here, but Apple's iPad is expected to be the biggest holiday gift this season, Scarsella told Wallet Pop in a telephone interview. The good news is that Apple isn't having shipping delays on the iPad, so shortages aren't expected, at least from Apple, Scarsella said. 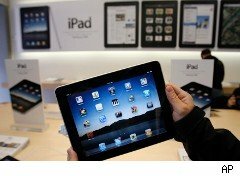 The iPad has already surpassed DVD players as the fourth best-selling consumer electronic product of all time, also surpassing first year iPhone sales. With more stores selling it (Target, Sam's Club, Walmart, Amazon and Verizon), the iPad is easier to find. But being the most sought-after gadget this year could make finding one in a store difficult. "This is probably going to be the hottest gift, I expect," Scarsella said. "Even retailers could run out of it." A second generation iPad is rumored to come out next year, so you could wait for the hottest product on the planet. But again, who wants to sit at home on Christmas day with a rain check in hand? Scarsella said it may come out in the second quarter of 2011. Gazelle's Scarsella sad he expects the Galaxy Tab to be launched before Christmas, and it will be the biggest rival to the iPad. It will be the first Android tablet and will probably be subsidized through a contract for 3G service, he said. Rival tablet manufacturers are expected to have them in early 2011, with some arriving before Christmas this year. The Samsung Galaxy Tab is already out in Europe and should be in U.S. stores sometime this year, although a release date hasn't been announced. Let's hope it comes out in time for Christmas. You could probably do all of your Christmas shopping at an Apple store and make everyone on your list, including Steve Jobs, happy for a full year. The fourth generation iPod Touch is another hot Apple product this Christmas that you should buy now if you don't want to miss out, Scarsella said. This and other new iPods, such as the new Nano, can be found with slightly lower prices than Apple at some retailers that are competing on price to get shoppers in the door. Teenagers and hard-core gamers aren't the only people driving up sales of video games and game systems. Adults, families and children are playing more, especially since the Nintendo Wii has grown in popularity. Scarsella expects the PS Move and the Xbox Kinect to be popular this Christmas. Both try to match the Wii with a camera and sensor to mimic a player's movements. The Move is already out and the Kinect is due out Nov. 4. Halo: Reach, which is already out. "TV's are always a good buy for Black Friday," Scarsella said, with prices dropping on LED and LCD televisions. The good news is that because so many retailers are selling TVs, low prices can be found for this popular Christmas gift. LED TVs are newer and can cost 20% to 30% more than LCD TVs, which are in oversupply and selling remarkably well, said Phillip Yang, content manager at Bestcovery, which offers expert reviews of many items. An average price for a 32-inch LCD TV is $399, Yang said. The best time to buy is before the end of the year, or look for a sale before the Super Bowl on older models that will be replaced in March when new models arrive, Yang said. Add-on boxes from Apple TV, Google TV and new Roku boxes are expected to be hot this Christmas, as Internet TV looks to take off, Scarsella said. For $60, a Roku box will stream movies from Netflix to your home TV, and the price goes up from there. An Apple TV box is $100. The Logitech Revue for Google TV is $300. The Kindle 3G e-reader is $189 and is the best e-book reader available, according to Scarsella. "If you really don't need an iPad and you're into e-book reading, the Kindle 3 is your best bet," he said. Amazon temporarily ran out of them in July, but they're in stock now. It may sound old fashioned to have a camcorder, but Gazelle's gadget guru says the Flip Ultra HD and Mino HD are excellent camcorders that should sell well this Christmas. Who doesn't want Christmas morning video of the family opening presents? Beats headphones by Dr. Dre with Justin Bieber's name on them sell for $120, making the $200 on-ear models look ridiculous. But they're getting plenty of play, Scarsella says, along with other high-end headphones such as $350 models from Klipsch and $300 wireless headphones from Sennheiser.